At the beginning of Tertiary time the American continent seems to have had almost the size and shape it now has excepting a narrow border along the Atlantic and Gulf lines and a small area extending up the Mississippi to near the mouth of the Ohio river. The great inland sea area which existed throughout Cretaceous times between the Rocky mountains and the Mississippi valley had been changed to dry land. The accompanying map, Plate XXV, shows the geography of the United States at the beginning of Tertiary time. It was the whole of the United States minus the parts marked as Tertiary lying along the Gulf of Mexico, the lower Mississippi valley, and the Atlantic ocean. The great inland Tertiary area, as will shortly be seen, was dry land. while the Tertiary areas along the ocean boundaries were still under water. The degree of elevation which occurred in the west central part of America at the close of Cretaceous time is difficult to determine with exactness. It is probable, however, that the Rocky mountain area was elevated permanently above ocean water and to a sufficient hight to give a decided drainage in various directions. The Tertiary of America may well be divided into two classes; one, which was deposited under ocean water on the Atlantic and Gulf border areas; and another which was deposited by rivers and under lake water on the great inland area, including all of the inland plains Tertiary and the various Tertiary formations in different places in the Cordilleras. The elevation of the mountainous area was therefore sufficient to cause a great spread of mountain debris in many directions. The lesser areas in the valleys of the mountains were occupied probably by fresh water lakes, and as the descent from the mountain sides was rapid the accumulation of sediment was correspondingly rapid and the filling in process carried to a great extent. Eastward from the mountains the material was likewise carried in vast quantities and spread out over the present plains area. It was not accumulated to such great depths, the thickness rarely exceeding 1000 feet, while over the western part of Kansas we nowhere find it at the present time more than 350 feet thick. The mountainous elevation was probably less during early Tertiary times than at present. The drainage which carried the debris eastward seems to have been fluctuating in character, at times flowing with a strong current, as is shown by the coarseness of the material carried, and at other times moving with a mild current, so that only the finer sediments could be carried and deposited. THe floor upon which the Tertiary material was deposited was principally a Cretaceous floor, one which doubtless bad been elevated above the ocean water for a sufficient time over the greater part of the area to have its surface greatly corroded by the weathering agents until it presented an irregular surface. If the corrasion of the Cretaceous surface occurred after the entire inland ocean was destroyed the drainage producing such a corrasion must have been eastward. It is difficult to understand why such a drainage would not carry debris from the mountainous areas the same as a similar drainage did at a somewhat later period. It seems probable there. fore that the eastward movement of the debris began about the time the corrasion of the Cretaceous surface began, and that the two processes were carried on to a great extent simultaneously. Possibly the particular character of the surface drainage was such that relatively large areas on the plains received no material from the mountains for a time, corresponding somewhat to the present condition with so many streams rising farther east than the limits of the mountains. In this way sediments may have been forming over certain parts of the plains during the earlier Tertiary or Eocene period, a corrasion of the surface of other portions taking place at the same time. By slight change of elevation in the plains, or in the mountains, at a somewhat later date the conditions could have been changed so that the areas before disconnected from the mountains were now connected with them, and the debris likewise spread over their surface. From paleontologic evidence it seems that the northern part of the plains Tertiary, or that in the Dakotas and northern Nebraska, is older than the lowest Tertiary farther south in Kansas and the Indian Territory. It is possible that the explanation for such a condition is that just given. In this way the great corrasion of the surface of the Cretaceous in Kansas could have occurred during the time that the accumulations of the earlier Tertiary materials were forming in northern Nebraska and the Dakotas and possibly elsewhere in the mountainous areas. Near the beginning of the Neocene period changes were brought about in one way or another so that the drainage from the mountains spread sediments continuously from the Dakota-Nebraska area over the western part of Kansas and into the Indian Territory and farther south in Texas, reaching even almost as far as the Rio Grande. The Tertiary material in Kansas is composed of gravel, sand, black sand, clay, and silt, with a small amount of material usually called "volcanic ash." The gravel is pebbles varying in size from four or five inches in diameter to the finest of pebbles, grading into the sand. Their character is such that no doubt can be entertained regarding their former home. They are composed of granite, syenite, porphyry, andesite, rhyolite, basalt, and not infrequently of pure quartz. In the granite pebbles the feldspars are generally of a reddish hue, but frequently the lighter colored ones seem to abound. It has been thought that the general character of the pebbles was different in different parts of the state; that those in the northern part differ materially from those in the south with intermediate grades between. During the two summers of active field work in the Tertiary areas of the west the writer has paid considerable attention to this phase of the subject, and at the present can only say that thus far variations in character of the pebbles do not seem to be general, but only local, and probably accidental. He is not familiar with the crystalline rocks of the mountainous area in detail. 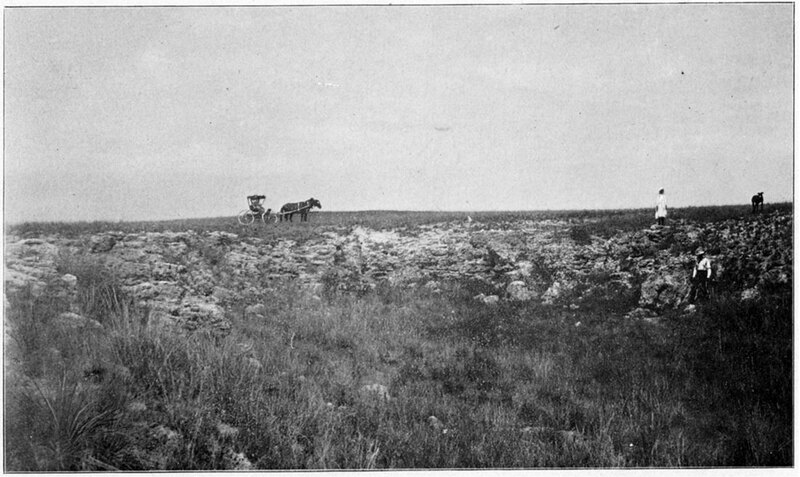 It is possible that if one were a careful study of the pebbles in Kansas might show a corresponding variation in character, so that an estimate could be made regarding this particular part of the mountainous area from which such pebbles were derived. But without such a knowledge of the crystalline rocks to the west it is doubtful if a discrimination between the character of the material in the pebbles found in the different parts of western Kansas will have any considerable value. Reddish feldspar is found along the northern border of the state, and in every county from the north line to the south. Dark colored material, which probably was hornblende or black mica, is associated with the feldspars in every part of the state. Quartz grains also are intimately associated with the feldspars throughout the whole area. Occasional pebbles of basic rock are likewise found promiscuously scattered from the north line of the state to the south. Free quartz, or pebbles composed entirely of quartz, are found here and there lying in the sand and gravel beds beside the granite pebbles. At different periods of our investigation in the west it almost seemed that such a variation in the character of the gravel could be found. Doctor Adams, who has spent two summers in this country, reported in the autumn of 1895 that he was pretty well satisfied such a distinction between the character of the pebbles north of the Arkansas river and those south of it could be made, and might be of value. But the field work during the summer of 1896 largely dispelled this idea. The individual gravel beds lying to the west and southwest of Meade in Meade county are composed essentially of the same gravel as those on the north bluffs of the Arkansas river, and of those much farther to the north, even almost all the way to the north side of the state. 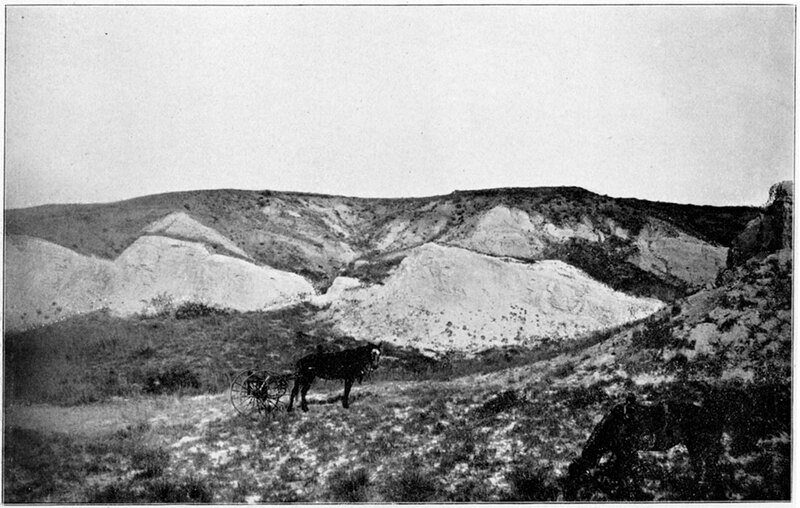 We may therefore dismiss the idea that anyone can discriminate between the character of the crystalline gravels in different parts of western Kansas, without a detailed knowledge of the crystalline rocks to the west so that a relatively obscure yet essential distinction might be noticed in the gravels corresponding to similar distinctions in the rocks of the Rocky mountains. Students of petrography will appreciate this point, for they well understand that such distinctions sometimes are important between different classes of rock, distinctions which are so obscure in general character that one unfamiliar with them would not be able to make a corresponding distinction between the gravels produced from them. The character of the sand is similar to that of the gravel. It is much more largely composed of quartz, as sand usually is principally pure quartz. 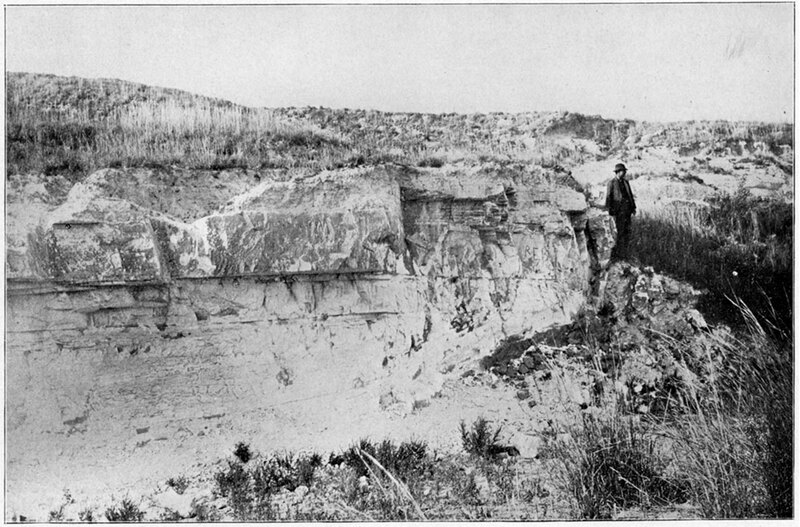 But perhaps it would be difficult to gather a handful of the sand anywhere in the whole Tertiary area of Kansas which did not show minute granules of feldspar and other constituents of the rocks of the mountainous areas to the west. The sand grains are generally rounded to a great extent implying long distances of travel. As regards degree of division the sands vary throughout almost the entire scale. On the one hand they grade into the finer gravel with no line Of demarcation between. On the other hand they reach the finest granules microscopic in dimension, and are so intermingled with the fine particles of the clay and silt that frequently one can hardly distinguish between them without washing the mass to get rid of the floating clay particles. The sand is sometimes quite well bedded when found in place, but often is; almost structureless. 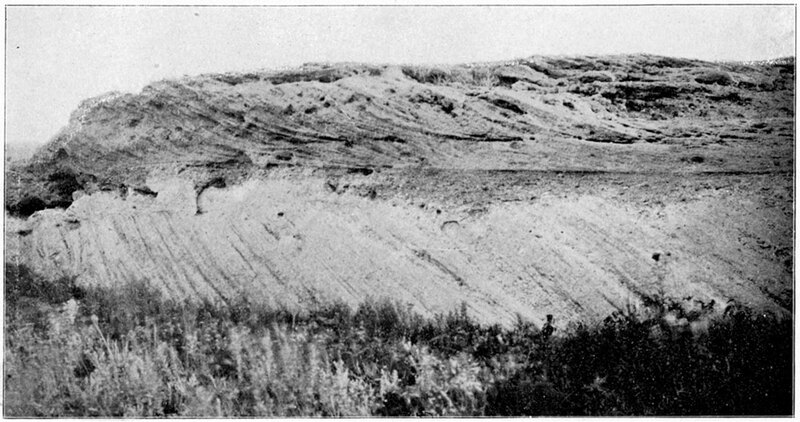 Cross bedding is a common condition to observe, as is shown in Plate XXXVIII taken from a bluff near Dodge City along the Arkansas river. Almost everywhere over the Tertiary one frequently finds small accumulations of black sand which have been slightly segregated by the rainwater carrying away the finer materials and leaving these little granules behind. They are composed almost entirely of grains of black oxide of iron, the greater portion of which are granules of magnetite, as can readily be shown by placing them within reach of a magnet. Usually about one third or one fourth of the volume will not be attracted by the magnet, and are doubtless particles of dark colored hematite. These little granules are originally intimately mixed with the clay and the silt in the upper portions of the deposit so that they are entirely unobservable under ordinary conditions. But when the rains come the little rivulets of water on the hillsides carry the lighter and finer clay and silts away and wash the iron oxide grains into little streaks which lodge here and there in the rock or on the hillside or are spread out in the fields and attract attention. Unfortunately the general appearance of this material is the same as that of the black sands so frequently found in connection with the placer gold mines of the west. In fact they are probably the same material. But being so much lighter than the gold dust which is associated with them in gold mining localities they have been carried to the east from their original home and have gone far beyond the limits of the gold which is mixed with the sand in gold mining localities. Many a citizen of western Kansas has had his expectations wrongfully excited on account of his superficial knowledge of the association of this black sand with gold dust in placer mines. He has neglected to consider that the higher specific gravity of the particles of gold would cause them to lodge much nearer the mountain side than these granules of iron oxide are found. As the result of this he has expected that the presence of the iron oxide implied the presence of gold. Many samples of black sand have been sent to the University for examination, not one of which had the slightest trace of gold. Usually it is sufficient to make an examination with the microscope. But different individuals have so insisted on an assay that occasional samples of the black sand from western Kansas have been assayed for gold. Such assays have been made in the chemical laboratory of the University, and have invariably resulted in finding no trace of gold. The clay and silt vary in character from place to place and at different depths. Occasionally almost pure masses of clay are found, beds almost entirely free from admixtures of sand, clay with a high degree of plasticity, and which in every respect resembles the purest character of clay known, excepting sufficient impurities to modify its color. Frequently such masses of clay seem to be colored with decaying organic matter, as though during its accumulation organic matter in one form or another was present at least in limited quantities. Elsewhere the color of the clay seems to indicate the absence of organic matter of any kind. In a few localities a material exists in small quantity throughout the Tertiary of Kansas, which for years has been called "volcanic ash." Under the microscope it appears to be composed of irregularly outlined thin flakes of a glass-like substance. When examined with polarized light it is almost entirely free from double refraction, in which respect it further resembles glass. The color of this material is variable passing from almost a pure white to various shades of light buff. It is frequently well stratified, sometimes even to minute proportions. The lesser stratification surfaces occasionally have most delicate and beautiful wave lines marked in them, such as might be produced by gentle wave action in water or wind action upon a dry surface of the material. Plate XXXIX represents the ash as it appears well stratified along the south bank of a tributary to Spring creek about a mile west of Meade. The upper layer, 4 feet thick or more, is very weakly cemented, yet it has more firmness than the lower beds which are gradually blown away by the winds leaving a slight projection of the upper and heavier beds. The lower beds gradually disappear to the right, near where the man is standing, and have their stratification lines converging in that direction as is faintly shown in the plate. Elsewhere the ash rarely if ever shows such prominent stratification lines. The localities at which this volcanic ash is found are relatively numerous, but seem to be entirely disconnected. What seems to be the same material is found in different places in Nebraska, in a dozen or more counties in western Kansas, and westward into, Colorado. Sometimes it covers but a few square rods in area, and rarely more than a few acres. Cragin has suggested that these isolated deposits be considered as a definite terrane and has offered the name Pearlette Ash for it, the name referring to an abandoned country postoffice on the plains of Meade county. [Prof. F. W. Cragin, The Pearlette Ash; Colorado College Studies, Vol. VI, p. 54, Colorado Springs, March 1896.] There is no evidence of any relation between the different isolated deposits excepting as it seems probable to some that they must have been formed at about the same time on account of their probable origin as implied by the name volcanic ash. As it is yet an open question regarding the true nature of the material, and much more so regarding its mode of deposition, it is hardly desirable to draw many conclusions from their supposed origin. It is correspondingly less desirable to group the little isolated patches together and assign them to a geologic terrane including nothing else. The structural relations of the different Tertiary materials are far from regular. It is doubtful if there can be any definite stratigraphic relations established covering a considerable scope of country. A description of the conditions will first be given, and later a discussion of the same. The gravel and sand are frequently cemented into a moderately firm rock by the presence of a variable amount of a calcium carbonate cement. This is sometimes found in the clay as well, but it is most abundant in the sand and gravel, producing a sort of sandstone or conglomerate to which the name mortar beds or "grit" is generally applied. Some of the varieties of this are the so-called "natural mortar," which is extensively used throughout the west for making a mortar to plaster with and to roof houses. These mortar bed horizons are prominent features in many places, and constitute the only hard and resisting strata in the Tertiary. The idea so frequently expressed that they are located near the base of the Tertiary is correct for some localities, but incorrect for others. Along the Prairie Dog from near its source to the eastern limits of the Tertiary the mortar beds are frequently found, often in a high degree of development. They frequently lie near the tops of the hills. On the south bank of the stream at Clayton they furnish two well defined horizons, the uppermost one near the top of the hill, and often 20 or 30 feet thick. Below these we have 20 or 30 feet of clay and sand which is poorly cemented, and then the second mortar beds horizon which will average 20 feet or more in thickness. There is so much difference between the hard and soft layers that weathering has given the bluffs a terraced appearance. The mortar bed layers contain much gravel and ordinary sand. The exact distance below them to the base of the Tertiary is not known, but it must be 50 feet or more. On the high divides both north and south of Stockton, in Rooks County, the Tertiary covers the country. The very summits of the highest hills are capped with the mortar beds which in this locality, particularly to the north of Stockton, is cemented with a silicious cement until the rock has been changed almost into a quartzite. The thickness of the Tertiary here is not definitely known, but probably is in the neighborhood of 100 feet. Southward from these localities along the different tributaries of the Smoky the mortar beds are frequently found at the summit of the hills. They are as frequently found, however, in intermediate positions, and possibly at or near the base in many instances. It is certain, however, that in many cases they are found near the uppermost surface of the Tertiary in much greater abundance than near the base. Along the Pawnee and its different tributaries well developed forms of the mortar beds are frequently found, sometimes occupying one horizon, and at other times another. Along the Buckner in the southwest part of Hodgeman County the sand and gravel are as firmly cemented as at any place known to the writer. Here they form a tolerably solid rock which lies at the top of the bluffs on the south side of the Buckner. They are in beds from 10 to 20 feet thick, varying much more than ordinary sandstone beds do. Below them in this locality the bluffs are composed of a looser and finer material. At other places along the Saw Log near by the mortar beds are found near the bottom of the Tertiary, and not infrequently resting immediately upon the Benton limestone. The north bluff-line of the Arkansas river from some distance below Dodge City westward almost to Garden City is protected by a well developed mass of mortar beds. Throughout the most of this distance three distinct layers of mortar beds can be traced, while in other places four or more may be found. They are composed of cemented sand and coarse gravel, and are separated from each other by beds of clay and fine sand. The weathering processes wear away the soft clay beds more rapidly than the mortar beds producing a series of narrow terraces along the bluffs similar to those generally observed in places where the limestones and shales alternate with each other, as is so frequently found in the eastern part of the state. South of the Arkansas river but little of the mortar beds material it to be seen until the vicinity of Crooked creek and the Cimarron is reached. Here we have the same lack of regularity so noticeable elsewhere. The most pronounced form of the mortar beds are often found at the very summit of the bluffs, but by no means always so. In other places they occur midway up the bluff, and not infrequently near the base. The bluffs of Crooked creek below Meade are good examples of this. On the eastern side of the creek they are very rugged, with frequent instances of mortar beds being well developed, but by no means do they form a constant stratum continuously along the bluff. On the western side the bluff line is not so abrupt, and consequently there is not so good an opportunity for observing the mortar beds masses. To the southwest of Meade along the upper portion of Spring creek, however, some of the hilltops are very distinct and the erosive forms are significant of hills with a protecting cap of hard material covering softer materials. These can well be studied from the Meade topographic sheet. A few of these hills are particularly noteworthy. On the north bluff of Spring creek about four miles above Crooked creek valley the mortar beds are found lying at the summit of the hill. The sandy clay underneath is worn away so that quite frequently the mortar beds rock projects several feet, forming an overhanging cliff. South of Spring creek a similar condition obtains. Hill point after hill point stands out in the landscape as prominent features, on the top of which a horizontal mass of mortar beds rock serves as a protection to the soft and easily eroded sandy clays beneath. Along the Cimarron river from some distance above Arkalon to where the river encounters the Red-Beds near Englewood its valley is cut downward into the broad plain to a depth of nearly 200 feet. As one stands on a prominent point on either side of the valley and looks up and down the stream it is easy to see the line of light colored mortar beds lying almost at the summit of the bluffs, with the darker colored shales and sands beneath. A more careful examination shows that for many miles along the stream relatively firm rock covers the topmost part of the bluffs, and is largely responsible for the precipitous character so pronounced on either side of the river around Arkalon. Beneath the mortar beds is found masses of sandy clay which constitutes the main mass of the bluffs. There is strong correspondence between the characters here and that shown in the well at Liberal soon to be described, in that the coarsest gravel is found near the surface. In summarizing the above observations it may be concluded that there is a lack of regularity in the position of anyone kind of material, whether gravel, or sand, or clay, or the cemented product called mortar beds. During the last two years the Kansas State Board of Irrigation has sunk twenty wells in western Kansas, the greater portion of which are confined to the Tertiary. One of the provisions in the contract for the drilling of each well was that a carefully selected and accurately labeled suite of samples was to be preserved and delivered to the Board, such samples to be taken with sufficient frequency to accurately represent the character of the material passed through. These samples from the different wells were turned over to the writer by the Board of Irrigation and have been carefully examined. This is the first time one has been able to examine the Tertiary materials at any considerable depth below the surface, excepting where they are found along the bluff lines of the various drainage streams. They are therefore of more than ordinary importance, and are worthy of considerable notice in this connection. It was found that little relation existed between the distance from the surface and the size of the gravel. Gravel beds of a considerable degree of coarseness were frequently found near the surface, and the finest sand, and clay, and silt were not infrequently found near the base of the Tertiary. There was such an irregularity of position shown with reference to any one material, and such a lack of definite relation between the different kinds of material, that it seems as though but little if any dependence can be placed in any older classifications. In order to show what the conditions are the sections of a number of wells will be given. 5. 6 ft. sand and coarse gravel 105. It will be noted in this well that a large amount of gravel was met with at less than 75 feet from the surface below which was a sandy clay cemented with calcareous cement, then another layer of sand and gravel, then again sandy clay with calcareous cement, below these a 20 foot bed of sandy clay, then another stratum of coarse sand and gravel, below which was found yellow sand, again sand and gravel, and then a layer of clay which was almost entirely free of sand. Below all these we have 22 feet of water-bearing sand and gravel with a sandy clay in the bottom of the welL The well is located on the high uplands about 180 feet above the level of the river valley to the south. Along the bluffs on the north side of the. river at this place and farther west the Benton formation is exposed to the surface. To the west the Benton is shown along the banks of different ravines entering from the north. The materials of the Tertiary where exposed along the bluff are frequently cemented by calcium carbonate into a relatively firm mass of rock called" Tertiary grit, or mortar beds. But when the well itself is reached it is noticed that there was practically no calcareous cement found more than 110 feet from the surface, although the well went to a depth of 196 feet. We therefore have nothing in this well to imply that the coarse material lies at the bottom and the finer at the top. At this place there seems to be a total absence of any calcareous cementing material which is so abundant in the bluffs on the north side of the river at about the same altitude. It will be seen from these that no more gravel is found during the last 60 feet than there is during the second 60 feet, while the clay is interbedded here and there, or is mixed with the sand entirely regardless of depth from the surface. In this case we find the coarsest gravel near the base of the Tertiary. Here it will be seen that there is a stratum of sand and gravel beginning near 100 feet below the surface, and also that we have a mass more than 20 feet thick carrying considerable clay 'lying at a depth of nearly 200 feet. The well stops before the base of the Tertiary was reached, so that it is not known what lies beyond. Going back southward to Ford County, another well was put down on the high uplands about two and a half miles north of Dodge City. The bluffs for miles along the river near Dodge City have three distinct strata of sand and gravel strongly cemented with calcium carbonate into a more or less firm rock. They are separated from each other by beds of clay carrying a smaller amount of relatively fine sand. In places below these other beds of gravel likewise cemented are found. It will be noticed here that in general the coarser material is at the bottom and the finer material at the top of the well. The state well at Liberal is of considerable interest on account of so great a lack of coarse material. It is located about two miles northwest of Liberal on the high uplands south of the Cimarron river. The character of the material immediately below the surface soil may be described as a coarse sand with large quantities of gravel, some of which are f'rom two to three inches in diameter. In making the excavations for erecting the windmill tower several wagon loads of this material were thrown to the surface, from which bushels of coarse gravel could have been screened. Intimately mixed through the gravel was clay and sand of all degrees of coarseness, so that probably no more than a fourth or a fifth of the volume of the whole material was gravel. Below this the material is relatively fine, until a depth of about 100 feet is reached when more coarse gravel was found. Below this much more fine material was: passed, and near the bottom of the well a day mixed with fine sand constituted a heavy layer. The calcareous cement was present in this well in an unusual amount and was about as uniform in location as has been seen from other wells. These well sections may be taken as a type of all the state wells and of several hundred private wells examined with more or less detail during the past two summers. By carefully studying them it will be seen that there is altogether a lack of any definite regularity in kind of material passed through, no matter whether we regard the sand, or gravel, or clay or the calcareous cementing material. The mortar beds of Hay which have been so generally described as lying near the base of the Tertiary are composed essentially of sand and gravel cemented with calcium carbonate. There is no limit to the degree of coarseness or fineness of the sand and consequently the only essential feature to produce the mortar beds structure is to have a sufficient amount of the cementing material to hold any mass of sand or gravel, or a mixture of the two, together with relative firmness. In fact it frequently happens that the clay carried but little sand and no gravel Whatever, but is cemented together in a more or less firm mass so that it too has been generally designated by the term mortar beds. These records show that the cementing material is exceedingly irregular in its distribution. Generally it is most abundant some distance above the underground water, frequently near the top of the well. In no instances known to the writer is the cement found in the same horizon with the ground water. In a few instances only. such as Grant County well No. 3, is there any of the cementing material below the water. If we use the presence of the calcareous cement as a criterion for judging the mortar beds, from the well records the same as from surface exposures, we must conclude that they are in general as near the surface as they are its base. In studying the physical properties of the Tertiary it is necessary to emphasize the conditions already stated, that the so-called mortar beds are simply the sand and gravel and clay materials cemented usually with calcareous cement. The real stratigraphic conditions probably do not depend upon the presence or absence of cementing material, but rather upon the continuity of beds of like material. A stratum of gravel which is not cemented should be considered as important as though it had chanced to have its individual constituents held together by a cementing material of some kind. Yet in our study of the subject we are usually inclined to regard the beds which are cemented into a firm rock as more important than softer materials. It is necessary, therefore, to look with considerable care at the character of the cementing material, and to determine if possible its origin and the manner of its formation. The cementing material of nearly all the Tertiary sands and gravels which appear in the form of sandstones or conglomerates is calcium carbonate. A few exceptions are known to this rule. There is a sandstone near Long Island, in Phillips County, which is so firmly cemented with silica that a rock similar to quartzite has been produced. On the uplands north of Stockton likewise a silicious cement has been deposited between the grains of sand producing a rock which is quite like quartzite. Near the Saint Jacob's well in western Clark County silicious cement has been deposited between the grains of sand, forming a close-grained rock. But throughout the Tertiary area of the state, with these few exceptions, wherever the sand and gravel are held together by any kind of cement it seems to be calcium carbonate. The firm mortar beds near Dodge City and elsewhere crumble to grains of sand and gravel when acted upon by an acid which will dissolve the calcium carbonate. The degree to which this cementation is carried is astonishingly great. In an examination of materials from the different state wells as already referred to it was found that with scarcely an exception the whole of the materials taken from them and at a distance more than 3 or 4 feet below the surface retained enough carbonate to effervesce strongly when placed in acid. Every pinch of clay or loose sand, with the exception of the sand which is water-bearing, would effervesce vigorously. The amount of cement is exceedingly variable, even in the same kind of material. There are horizons in most parts of the state at which the clay and silt are heavily charged with calcium carbonate. Sometimes this will be a thin layer not exceeding 12 to 20 inches in thickness. Other times it will be a mass 20 to 40 feet in thickness. Occasionally a layer of such fine calcium carbonate is near the surface and plowed fields frequently have a light color as a result which in the distance looks almost like snow. The arrangement of the cement in the mortar beds is more regular than elsewhere, but not infrequently here even it is quite irregular. It almost always shows an approach to concretionary forms. In different places along an exposure of the mortar beds a careful examination will show that the first deposition of the cement was in the form of granular masses. 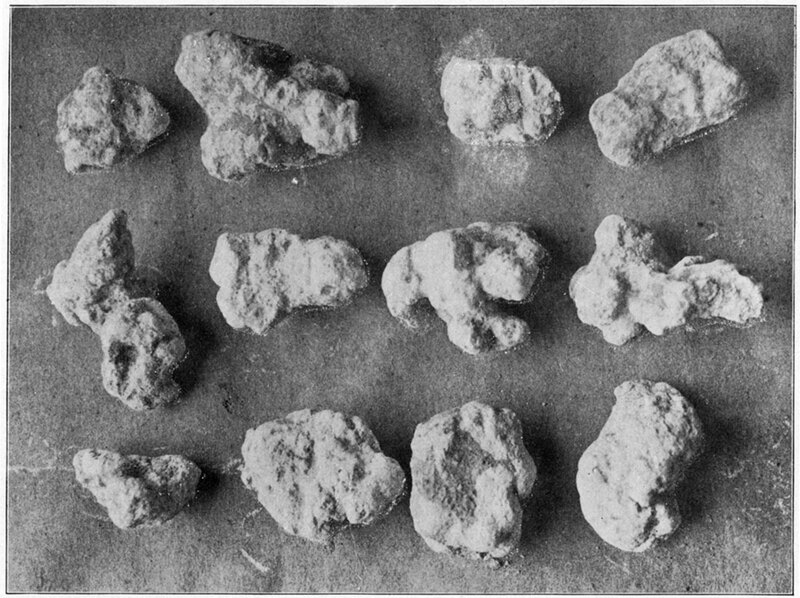 A later deposit cemented these together into larger masses or concretions and in many instances a third or fourth period of deposition is plainly marked so that the larger fragments previously formed are included in one concretion frequently of from four to six or even eight to ten inches in diameter, and possibly much larger. In the beds of clay and in sand beds where the supply of cement seems to have been limited odd shaped masses are often produced. The concretionary granules assume the shapes of common concretions, rounded, spherical, oblong, and irregular. Plate XLI is a reproduction natural size from a photograph of such nodules gathered in the northeastern part of Logan County. Frequently instead of producing the somewhat rounded nodular concretions elongated masses extending up and down are formed, sometimes with radiating lines reaching in different directions as though water containing calcium carbonate in solution in working its way downward through the beds of clay found more ready channels there than elsewhere. Plate XLII is from the photograph of a clay bank in the southern part of Sheridan county on one of the tributaries of the Saline river. It is similar, to those found over the whole country. The granules of sand and particles of clay in such cases are held together with a firmness approaching that of the mortar beds themselves. 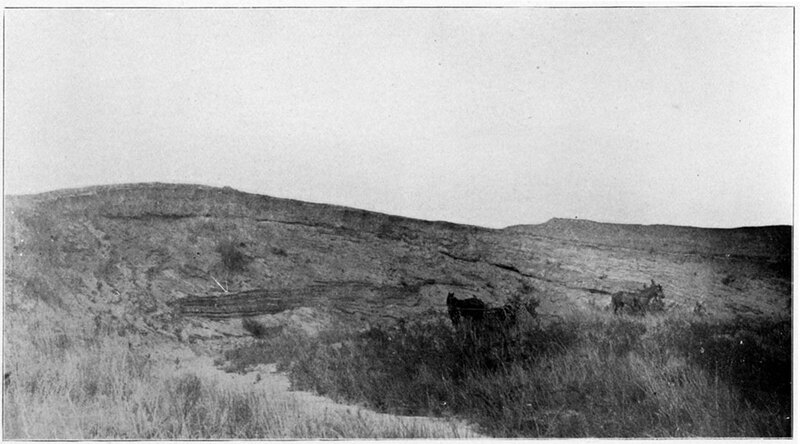 Mr. Crane, who spent the greater part of two summers in the northwestern part of the state, in describing the forms assumed by such concretionary masses likened them to the results we might expect were large quantities of molasses poured upon beds of sand and clay and allowed to work its way downward through whatever channel or more porous areas it might find. This somewhat homely illustration perhaps is as good as can be given. The elongated direction is by no means always vertical. Bifurcations and trifurcations in the mass are frequent and different vertical masses are frequently connected by radiating lines as though there was a connection. between the depositing agents in the different channels. A microscopic examination of the white masses which are thus firmly cemented shows that the calcium carbonate exists principally as well formed crystals usually of aragonite. The thinner beds of such deposits generally are not held together very firmly but are loose almost like sand. The aragonite crystals in such cases are usually small, frequently measuring no more than 1-500 of an inch in diameter. Rhombolic calcite crystals are also found, but not so abundantly as the aragonite crystals. The larger masses and those held together more firmly seem to be structureless as though the carbonate was deposited under such conditions that a crystalline form could not be assumed. The geologic period during which the cementing material was deposited is difficult to determine, but if the views herein expressed are correct, the accumulation of the cement began as soon as the climate became arid, and continues until the present time. It may be stated, however, without reserve that the cemented masses bear evidence of having been originally deposited without the cementing material, and that the latter was deposited within them by percolating waters after they were accumulated in beds as they are now found. A question of no little importance is 'what water- carried the calcium carbonate and what was the source of the carbonate. To answer this it is desirable to consider first a few subjects which have an important bearing on the question. The Tertiary materials as has already been explained are principally derived from debris produced by the disintegration of crystalline rocks in the mountainous areas to the west. Such debris therefore contains a relatively large amount of calcium in one form or an. other. In this respect it is similar to the great mass of glacial debris scattered over so large a part of northern United States, which is generally supposed to have been principally produced by the weathering of crystalline rocks lying farther to the north. The recent weathering processes of the glacial material produces large quantities of calcium carbonate as is abundantly shown from the temporary "hardness" of almost all the well water found anywhere throughout the glacial area. Is it not reasonable to suppose therefore that by the similar weathering of the Tertiary material in Kansas and elsewhere on the plains calcium carbonate will likewise be produced which would be changed to acid carbonate and dissolved by the surface waters were they existing in sufficient quantity? The great mass of glacial material in northern United States at present lies in a humid climate. Therefore the rain waters fall upon the surface and dissolve the calcium carbonate as fast as it is formed, carrying it downward and away through the sub-drainage channels. On the great plains, however, the climatic conditions are different. The precipitation rarely exceeds twenty inches annually, while frequently it will not exceed ten inches per annum over large areas for a period of two or three years. When a rain falls carbon dioxide gas is washed from the atmosphere, the same as elsewhere, and the calcium carbonate formed near the surface by previous disintegration is rendered soluble exactly as elsewhere. But the precipitation is so light and the sand beds and clays are so dry that the water, working its way downward, is largely absorbed by the dry earth before it connects with the general underground water below. Such a desiccation process would leave the calcium carbonate wherever it chanced to be; that is, it would leave it scattered throughout the sands and clays. The gravel beds and sand beds, on account of their greater porosity, would permit the circulation of water more freely than the clays. As a result the ground water near the surface in its downward migrations would follow such beds more frequently and in greater volume than the clay beds. When a horizon was reached composed principally of coarse sand and gravel a lateral movement would result from the clay beneath acting as an obstruction to downward movement. The extent of the lateral movement would depend upon the amount of water and upon the distance necessary to be passed over before a downward outlet could be found. It has already been seen that the sand and gravel beds form large parts of the Tertiary areas. The downward move ment of the water from the rains would be very irregular. Where the channels were most open, that is in the gravels and clays, the, movement might extend laterally for long distances. If the gravel beds are irregular in their stratigraphic relations so that almost everyone comes near the surface at one place or another, it is not unreasonable to suppose that every gravel bed has had an opportunity to serve as a passageway for waters coming from the surface heavily charged with acid calcium carbonate. The ultimate drying up of such waters would deposit the carbonate in the beds of sand and gravel, the same as elsewhere. If a larger proportion of water traveled through them we would expect a correspondingly larger deposition of the carbonate. It is a noteworthy fact that the sand beds and gravel beds which carry such large quantities of underground water rarely if ever have any considerable amount of the cementing material. Such an occurrence' of water within the well cemented mortar beds is entirely unknown so far as our investigations have resulted. Thousands of wells have been examined which found the water in the loose sand or gravel, but no one is known to the writer in which water was obtained directly from the cemented masses. This is as it should be. The drying up of the water carrying the acid calcium carbonate could not occur here, and therefore the cement would not be deposited. It is recognized that this explanation for the time and manner of formation of the cementing material in the mortar beds of the great west has an important bearing upon a number of subjects connected with Tertiary stratigraphy. If correct it lays aside the somewhat laborious task, attempted by different geologists, of explaining how fresh water lakes, under which such material was supposed to have been deposited, could have become sufficiently charged with calcium carbonate in solution to produce the cementing material upon proper desiccation. It obviates the difficulty of assuming that the desiccation of those lakes was possible at a time while the incoming waters were sufficiently rapid to carry the gravel and coarse sand of the mortar beds, an assumption that no one has yet been able to make appear reasonable. It leaves untouched the question of the mode of formation of the beds of sand and gravel. No matter whether they are fluviatile or lacustrine in origin it provides a cementing material for such bed.s after they were formed. It also provides an explanation for some apparent perplexities of local stratigraphic conditions. On a hillside at the present time the water will penetrate to a depth of from 2 to 4 feet below the surface during a heavy rain. The evaporation destroys the moisture, leaving the cementing material only a short distance below the surface. By a repetition of this process there may often be deposited at about the same distance below the surface a layer of the white, chalky calcium carbonate from 1 to 3 feet thick in a plane inclining with the surface of the hill. Many local instances were observed of an apparent inclination of strata which doubtless originated in this way. Plate XLIII is from a photograph of a hillside south of the Cimarron river just south of the Kansas state line. Here the sand has been rolled down the side of the hill so rapidly that vegetation can not grow on it, showing that it is very recent in its movements. Yet the light layers of sand, inclined at as high an angle as it is possible for them to lodge on the hillside, are cemented sufficiently to cause the wind erosion to develop stratification marks within them. An example of this at one place seems to show that some of these sand layers had been moved during the last six months, and that the cementing material had been deposited by water working its way down the hillside after the little rains of the summer. It is not an infrequent occurrence to find slight incrustations on the surface of the sand in the beds of different creeks over which the water carrying acid calcium carbonate has probably passed producing a rearrangement of the sand beds less than three months previously. More than a dozen such instances were particularly noted and carefully examined. The conclusions arrived at regarding the deposition of calcium carbonate are in harmony with well known facts regarding the accumulation of alkaline materials and other soluble salts over arid areas which have imperfect sub-drainage. It is well known that all such localities abound in soluble salts that have been produced by the decay of surface material and segregated by running water which was subsequently dried up. The famous illustrations of the world are the shores of the great inland seas, such as the Caspian sea, the Dead sea, and the Great Salt Lake, with a larger number of less noted instances occurring throughout the arid country, such as the broad sand-covered valleys of almost all the mountainous streams which now downward through the parks and valleys where precipitation is light. Water obtained from such places is proverbially mineralized until it is unfit for domestic uses, the mineral material being accumulated in this well known manner. In some respects the position and character of the clay beds are of importance. As the clay deposits were formed from water with almost no current they represent the opposite extreme from the gravel deposits, and are therefore equally important in a study of the drainage conditions of the Tertiary formation. By an examination of the well records already given it will be seen that almost everyone of the wells passed through from one to many beds of clay. The Gray County well near the Cimarron found a very plastic clay almost entirely free from sand within less than thirty feet of the surface, although the well is located in the Sand Hills on the south of the Arkansas. This well shows that the sandhills are superficial ill position and do not extend very far under the surface. Well No. 3 in Grant County passed through more clay than all other materials combined yet it was located on the high uplands between the two Cimarron rivers. And so with the other wells. An examination of the various natural sections along the banks and bluffs of the streams reveals a similar set of conditions. Not infrequently do we find a section from 25 to 100 feet in hight which contains little but plastic clay. In other places similar evidences are obtained from wells drilled by private parties scattered here and there over the country. One of the most remarkable cases yet observed is that of a well drilled during August 1896 about three fourths of a mile south of the little town of Atwater, in Meade county. Here a well went to a distance of 288 feet, passing through nothing but clay, until almost the total depth was reached. Other wells near by found a much less amount of clay. This condition is frequently met with elsewhere implying that the clay beds are lenticular masses, sometimes elongated, and at other times circular in form. They are scattered all over and through the Tertiary of Kansas, and can not be located from surface indications. Such an oblong lenticular mass lies to the north of Garden City along the north part of the Arkansas river valley. Here, for a distance of four to six miles along the river, is a narrow strip lying just back of the river valley proper beneath which the clay exists from 75 to 100 feet in thickness. Many attempts have been made to obtain water in this particular area by different citizens, each of whom has usually abandoned his well because it was known that only a short distance either north or south water could be found in the sand beds at comparatively shallow depths, while if drilling was continued in the clay area a depth of 100 feet or more would have to be passed before water could be reached. The clay beds by no means are confined to such lenticular masses, but frequently appear as thin masses of clay spread out between layers of sand or gravel. The largest proportion of clay in the aggregate is undoubtedly intimately mixed with the finer grains of sand and silt, 'so that the plasticity is partially destroyed, and the general properties greatly altered. It is doubtful in fact if many localities can be found where a section would not show that at least nine tenths of the vertical thickness is partially composed of clay. Professor Hay introduced the term "plains marl" to designate a large part of the Tertiary materials of the plains. Over a large proportion of the whole Tertiary area the upper part is composed of a variety of soil similar in almost every respect to the glacial soils, of northern United States. The most abundant ingredient of such a soil is clay, the remainder of the prominent constituents being fine sand, a little organic matter, and some products of decomposition of the surface material producing soils. In general character this is surprisingly similar to the glacial loess so well known in many parts of the world. There is no. essential difference between. it and many forms of soil and clay found in the valleys, ravines, and streams of various sizes in other parts of the state, excepting that the proportion of sand may at times be greater here, and the feldspathic material is found in greater quantity. This loess-like material differs in character from the mortar beds to a considerable extent. Professor Hay has divided the whole Tertiary into two general classes, the mortar beds and the plains marls. For a convenient term to. designate the difIerence in physical properties of the different Tertiary materials no objection is apparent to the use of either name. It should not be assumed, however, that the plains marl has any more definite stratigraphic position than the mortar beds have. Many masses of clay and sand admixtures found 100 or 200 feet beneath the surface would soon become typical plains marl were they exposed to the surface long enough to be acted upon by the atmosphere, and to receive a slight admixture of organic matter. Plains marl by no means covers all the surface. A considerable part of the whole area is covered by sand in the form of sand dunes that are so prominent along the south side of the Arkansas river and elsewhere, so that it will not do to assume that plains marl is a continuous formation covering the whole surface. It is probable that many of the properties of the plains marl are largely due to the action of wind. Strong winds which are common in the plains country continually exercise a sorting action on the surface materials, effecting a separation of the finer from the coarser. It is probable that many of the sand dunes owe their existence as such largely to the finer silt and soil having been blown away, leaving the sand behind as a residual property. Correspondingly the accumulation of the fine material on the surface in other parts of the plains may be to a great extent an important factor in the production of the plains marl. The winds therefore have been an important agent in the arrangement of the surface materials, and probably continue that function to the present time. Could we have had an absence of wind over the whole of the plains from the close of Tertiary time to the present it might well be assumed that the division of the surface material into sand dunes and plains marl would scarcely have been possible. From these considerations it may be concluded that the plains marls in themselves have hut little stratigraphic importance, although they are so prominent a surface feature over wide areas at the present time. The location and general character of the sand dunes along the southern side of the Arkansas river were fully described in the article on physiography while describing that river. Other sandy areas are found here and there over the state which are of more than passing interest. On the eastern side of Crooked creek, from the vicinity of Wilburn to near Fowler, a sand area occurs which covers from twenty to thirty square miles, and which in many respects is very similar to the Arkansas area. Along the Cimarron river, particularly in the western part of its course in the state, sandhills abound. This is true in Grant County, and in Stevens, Morton, and Stafford counties, but perhaps more particularly true in Stevens County than elsewhere. Here on the south side of the Cimarron sandhills rivaling those along the Arkansas river cover wide areas. Likewise north of the river in different parts of the country sandhllls are by no means unknown, although they are not so abundant as south of the Arkansas. It is probable that the first essential in the formation of sand dunes was the somewhat irregular deposition of sandy material during Tertiary time. One can hardly believe that the distribution of sand throughout the Tertiary over the whole state was uniform. The cause of this lack of uniformity must be looked for in connection with the character of the drainage which brought the materials from the mountainous area-and spread' it over the great plains. A second factor which is doubtless important, and which has heretofore received but little attention, is the action of water during recent times in carrying away the finer and more easily movable particles of clay and silt, leaving sand behind as a residual product. There are so many examples of this process producing accumulations of sand that one can not doubt its efficiency. In order to accomplish this result the surface of the country must have sufficient inclination to produce a comparatively rapid drainage. The greater portion of the great plains of Kansas does not possess such drainage, but we find it in almost ideal form in the southern part of the state from Meade county eastward to Barber County. Here the inclination to the southeast is frequently as much as 20 to 25 feet to the mile. Every stream that rises in the upland has cut its channel to a depth of from 100 to 200 feet. At its mouth the little stream has reached its base level and the deepening of the channel has long ago ceased, and a widening process has been carried to a considerable extent. This wide valley or flood plain invariably is covered with sand which is simply a residual product left behind when the finer materials were carried away. The whole Tertiary from north to south contains a sufficient amount of sand to produce such residual masses were the proper drainage carried on. The production of many of the arroyos by subsurface creeping, as already described in the article on drainage, would carry sand along with the silt and clay so that such sand washes or sand areas could not be produced by this kind of erosion. But the sand would be left behind farther down stream where surface action began. A third factor in the production of sand dunes is the action of wind. The same winds that separated the silt and clay particles from the sand and blew them to great distances producing by their lodgment the plains marl likewise moved the sand grains from place to place and caused them to accumulate in certain areas which we now call sand hills, or sand dunes. The separating process of the wind is similar in most respects to that of water, so that here the sand left behind is a residual product from which the finer particles of clay and silt have been removed. The wind is constantly working over the loose surface materials, separating them into classes dependent upon their facility for being moved, and is producing accumulations of one kind at one place by making additions, and of another kind elsewhere by having matter taken away from it. It is believed that all or nearly all the sand hills of the entire state have been produced by one or another of these agents or by a combination of them. It is not infrequent to find gravel near the top of the sand hills on the south side of the Arkansas river, gravels which are too large to have been blown out of the river and into' their present lodgment places. The ideal that the sand hills on the south side of the Arkansas are due to northerly winds blowing sand from the river, as the same is now being carried downward from year to year, is hardly compatible with the presence of the larger gravel in the sand hills as just mentioned. [G. K. Gilbert, Underground Water of the Arkansas Valley in Eastern Colorado, p. 30. Extracted from the Seventeenth Annual Report of the Director U. S. Geological Survey.] Neither is it capable of explaining the occurrence of so many sandy areas in other parts of the state. If a north wind is more prevalent in the vicinity of the Arkansas river, so as to blow the sand from the river southward rather than northward, it may well be asked why we find so much sand north of the Cimarron river in the vicinity of Englewood and elsewhere, as has already been stated. The two localities are so close together that of course when a strong north wind prevailed at one place a correspondingly strong one would prevail at the other. It is by no means contended that the wind has not blown large quantities of sand from the river upon the dry land. There is a sentiment with the residents of the west that during the last fifteen years sands have traveled from the sand hills northward into the Arkansas river valley to a much greater extent than from the river channel outward upon the river valley. The filling up of the valley at the south end of the Cimarron bridge, as noticed in the discussion of the Arkansas river, is usually claimed by the citizens of that place to be largely due to sand traveling from the sand hills on the south. It is true, of course, that public sentiment is often in error, but one may well suppose that during the last fifteen years those who are residing in the Arkansas river valley, and who are having their farms yearly increased or decreased in size, depending upon their location in the river valley, would make relatively accurate observations upon this subject. We have no means of determining the climatic conditions in prehistoric times. The sandhills on the south side of the river might be credited to northerly winds in prehistoric times were it not for the large gravel found in them frequently at the summit of the hills. But this would not account for the sand of. other areas farther to the south, particularly those north of the Cimarron. Taking all in all it would seem that the explanations given include sufficient causes, each of which is in harmony with the results as 'we can now observe them. They are in brief, first, the unequal distribution of sand throughout the Tertiary materials at the time of deposition, and second, the separation of the finer material from the sand by water action and by wind action, leaving the sand behind after the finer material has been carried away. The particular shape of the sand dunes at the present time may be principally due to the action of wind, which has worn out cavities and built up hills and hillocks in such an irregular manner. Coarse gravel are found here and there over the surface throughout the Tertiary area of Kansas. Such formations are by no means as common or as extensive as the sand masses. In every instance noted they seem to be due entirely to the breaking down of mortar beds formations from which the gravel came to be scattered over the surface. Where a mortar bed once firmly cemented is brought to the surface by the erosive action of wind or water removing the plains marl from above it the weathering agents tend sooner or later to destroy the cementing calcium carbonate and set the gravel free. They are scattered over the surface ill such cases, covering it to varying depths depending upon the amount of gravel in the mortar beds, and the degree to which decomposition has been carried. At almost every place where the mortar beds are prominent features of a hillside or terrace the surface below is covered with gravel, sometimes to several inches in thickness. It is doubtful if there can be any regularity discovered between the beds of the different kinds of Tertiary material in western Kansas. The mortar beds occur at all positions from the base to the summit, as do also the sands and the clays. It has been found impossible to trace a bed of anyone material very far in any direction. The records of the state wells adds to this difficulty rather than to lessen it. Neither does the assistance of paleontology lessen the difficulty, but it rather increases it. 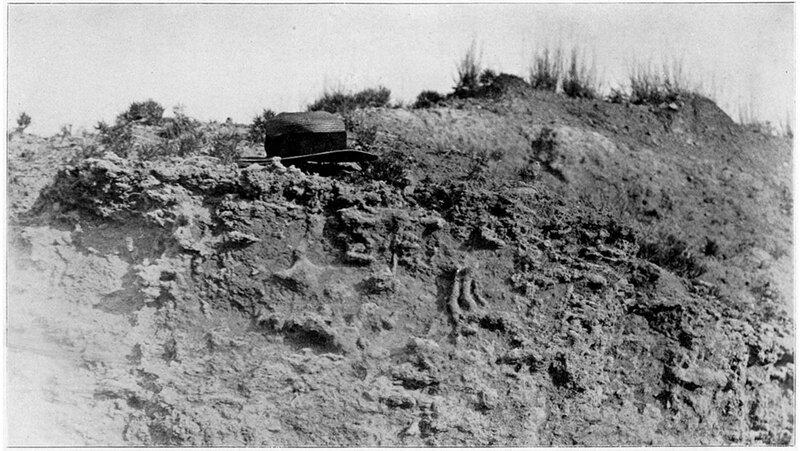 In Phillips County the mortar beds contain skeletons of the rhinoceros and other animals indicating that they should be correlated with the Loupe Fork beds of Nebraska, and that they are about the oldest Tertiary beds in Kansas. To the southwest in Meade county a mass of conglomerate which is as typical a mortar bed as can be found is rich in fossil horses, llamas, elephants, etc., which paleontologists class as Pleistocene fossils. We therefore have the mortar beds with Loup Fork fossils at one place, and with Pleistocene fossils in another, not only showing a lack of stratigraphic continuity, but showing that, after all, the so-called Tertiary of our state may be part Tertiary and part Pleistocene! Other Pleistocene fossils have been found in the so-called plains marl, as is fully brought out in the following article by Professor Williston. Paleontology therefore adds difficulty to the stratigraphic problem provided we try to divide the Kansas Tertiary into terranes, as has usually been done. [Note: See almost all literature on the Kansas Tertiary, particularly Hay's various geologic sections and descriptions, Scott's discussion of the Tertiary in Bulletin G. S. A., Vol. 6, p., and Cragin's discussion of the Meade Gravels, etc., Colorado College Studies, Vol. VI, p. 53 et seq.] If, however, we adopt the more rational view that the materials were principally accumulated by river action throughout a period extending from the earliest indicated by paleontology to the present the above difficulties disappear. From what has already been given it will be seen there is little if any room for doubt regarding the source of the Tertiary material. It has principally come from the great Rocky mountain area to the west. Portions of the mountain area have been dry land from early geologic times, and the weathering agents have acted upon such in the usual manner producing the ordinary products of decomposition of crystalline rocks, such as sand, pebbles of various sizes, etc. It is probable that throughout the main period of geologic history the elevation of these dry land areas was so small that the drainage carried away but a small proportion of the debris thus produced and that as a result an extraordinary amount of it was ready for transportation as soon as the elevation became sufficient to produce a considerable fall. It need not be doubted that a part of the Tertiary material was obtained from the underlying Cretaceous, but examination shows that this constitutes but an unimportant part. When the final elevation of the whole mountainous area was effected and the drainage became established across the great plains area to the Mississippi, the eastward migration of great quantities of debris began. "At the close of the Eocene a large part of the plains area, from middle Kansas indefinitely northward, became depressed and received the drainage which now forms the western affluents of the Mississippi, the Missouri, the Red river, and other of the British Columbia rivers, forming a wide sheet of water. "For this I propose the name Sioux Lake. "Unfortunately the Fortieth Parallel area only covers a very slight exposure of the series of the Miocene beds which accumulated in Sioux Lake, to which, long since, Hayden gave the name of the White River group." "Eventually the process of erosion was completely arrested and processes of decomposition took its place. This change was brought about by some modification of conditions which is not yet clearly understood. Perhaps the plains region was depressed at the west, and the slopes thus rendered so gentle that the streams could no longer carry off the detritus which came from the mountains, and it was deposited on the way. Perhaps a barrier was lifted at the east so that the base level stood higher. Whatever the cause the streams which flowed from the mountains onto the plains and thence eastward across the plains, ceased to carve valleys in the region of the plains and began to deposit sediment. When they had filled their channels so that their beds lay higher than the neighboring country, they broke through their banks, shifting their courses to new positions, and they thus came to flow in succession over all parts of the plains and to distribute their deposit widely, so that the whole plain in the district here described was covered by sands and gravels brought from the canyons and valleys of the Rocky mountains." "It is thought by geologists who have studied the formations of Kansas that lakes were formed there during a portion or the whole of this period, so that the sedimentation was from still water instead of from the currents of sluggish streams." The relative positions of the gravel, sand, and clay of the Tertiary over the whole of Kansas, as already given at considerable length, corresponds much better to river deposits than to lake deposits. The irregularity of formation succession, the limited lateral extent of the beds of gravel, clay and sand, the frequent steepness of the cross-bedding plains, all correspond to river deposits but are not characteristic of lake deposits. It is difficult to understand how such irregularity of material could have resulted if the Sioux Lake of King, or any other lake, had extended southward across the whole of the western part of Kansas and been a factor in the accumulation of the Tertiary materials. It is quite possible that during Tertiary time in which there were so many changes in the velocity of the water carrying the sediments, lesser local lakes and lagoons and swamps and marshes may have existed in different places and for varying lengths of time. But when we consider the Kansas Tertiary as a whole and yet in detail, it must be admitted that the materials themselves have many indications of river deposits and a very few of lake deposits. As best one can judge from the literature on the subject it is probable the heavy beds of loess-like material reaching nearly 1000 feet in thickness in Dakota, are of lake formation. The southern limit of such a lake has not been located and may have reached for a short time into Kansas territory. It is probable that no definite line will be found between this lake and the undoubted river deposits in the Arkansas river territory. If it was changed from a great lake into lesser lakes, then to the wide mouths or outlets of the streams during times of sluggish movement in the coarse gravel, depositions of a rapid current may be and probably are graded from one form into another so that no definite line of demarcation exists.